The Antares Rocket is the new heavy payload launch vehicle from Orbital Sciences. 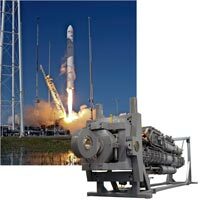 In 2009, Advanced Fluid Systems was selected as the hydraulic and motion controls manufacturer and integrator for the Antares rocket lift and retract systems. The project took thousands of man hours and years of development in one of Advanced Fluid Systems'' largest fluid power engineering projects to date. See our video and learn more on the Antares Rocket Lift and Retract case study page. The Chinook MHD mobile deicer prototype was designed as environmentally friendly aircraft deicing system with an advanced motion control system. Advanced Fluid Systems integrated the mobile hydraulic and thermal deicing fluid system into a joystick / LCD user interface with custom motion profiles and algorithms that automatically prevents equipment collisions. Learn more on our Deicer Motion Controls case study page.